As announced by the UFC, veteran fighter and UFC Hall of Famer BJ Penn will be making his return to Octagon competition later this year, at UFC 232 in Las Vegas, Nevada. Having made his UFC debut in 2001, former UFC Lightweight Champion BJ Penn is considered as one of the all-time greatest fighters to ever grace the Octagon. Penn, who is a former one-time UFC Lightweight and Welterweight Champion, last competed in the Octagon almost a year ago, in June of 2017 at UFC Fight Night 112 when he suffered a majority defeat to Dennis Siver. Since his move to the UFC Featherweight Division in 2013, BJ Penn hasn't been able to find his golden touch inside the Octagon, having lost most of his fights in the UFC. Penn is currently coming off losses against the likes of Yair Rodriguez and Frankie Edgar as well. 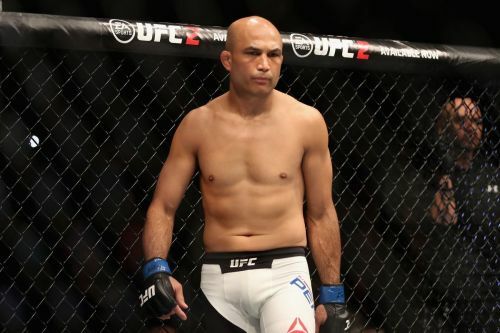 It has now been officially confirmed that former UFC Lightweight Champion BJ Penn will be officially making his return to the 155-pound division at the end of this year, as The Prodigy prepares himself to go head-to-head against 33-year-old Ryan Hall at UFC 232. This bout will also be the first time since December of 2016 that Ryan Hall will be stepping back into the Octagon, having scored a huge win over Gray Maynard at The Ultimate Fighter 24 Finale. As far as the veteran BJ Penn is concerned, the former 155-pound division champion will be looking to mark his first win in almost eight years as he is currently on a five fights losing streak. UFC 232 is scheduled to take place on the 29th of December in what will be the last UFC pay-per-view of the year. Till date, five fights have been confirmed for the event, with Cris Cyborg and Amanda Nunes set to go head-to-head in the main event. What are your predictions for UFC 232? Have your say in the comments. UFC 37: What happened when BJ Penn tried to bounce back from his first ever defeat?